We are providing Silverfish Control Service for all Commercial and Industrial spaces. With decades of experience in this domain, we are affianced in offering effective and reliable Silverfish Control Services. They can cause extensive problems by damaging valuable books, photographs, paintings, plaster and other household items containing starch or cellulose. We are looking for queries from all over Tamil Nadu Only. Bluesky Pest Tech Pvt. Ltd.
We are offering Silverfish Control Service to our esteemed clients. Our service is appropriately used in domestic, institutional premises and public buildings, hospitals, kitchen and restaurants etc. This service can be customized as per the specifications and requirements of our esteemed clients. Our services are gettable at best industry rates. We are among the well-known names in the market for offering Silver Fish Control Services. Our service is performed by our well-informed experts of industry who fallow the universal industry norms. Our service is broadly well-liked in the market due to their nominal prices and timely completion. We are among one of the cherished business names occupied in rendering to our clients Silverfish Control Service. Under the supervision of adroit executives, these services are delivered with excellence and are extensively valued all over the country. Apart from this, our cost effective rates and flexibility has made us a widespread market option. 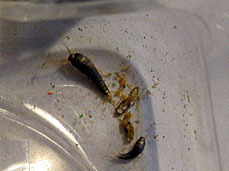 Silverfish are often active at night. They make quick movements, stopping at short intervals and then moving on rapidly. They prefer damp, cool and dark places. These services are useful for effective control of silverfish, carpet moths, spiders, cockroaches, ants, centipede and lizards. Silverfish are considered very insects. They are flattened from top to bottom having a scale like convering all over the body that gives them a silvery appearance. These insects are common in libraries, old stationeries, record rooms of colleges, schools and banks. Silverfish look like an actual fish with shiny skin, and they eat through clothing, paper and wallpaper. These bugs are light blue to silver, and when they crawl, they look as if they’re swimming. They grow as long as 19 mm in length, and they live in moist areas, such as under your sinks. Commonly found in homes( especially smaal red, black and ghost ants), they swarm around left overs, split food or drink and food trials back to their nest.